Rooms that we use to entertain require comfortable seating, good lighting and one thing that’s often overlooked – a surface within arm’s reach of every perch for drinks – in steps the occasional table. This October Currey & Company introduces more than a dozen fun and functional occasional tables. Adding an occasional table is a great way to update an interior and perhaps to add something unexpected to the room and give a final touch of texture or whimsy. Surfaces are required for more than just drinks or a cup of tea. Your favorite books stacked on a side table are an excellent way to add a personal touch to a room without adding the ubiquitous family photos in silver frames. The most versatile occasional tables are lightweight, easy to move and can be grouped or sprinkled around a room. This collection of new introductions is truly authentic and blends beautifully with many styles and tastes. 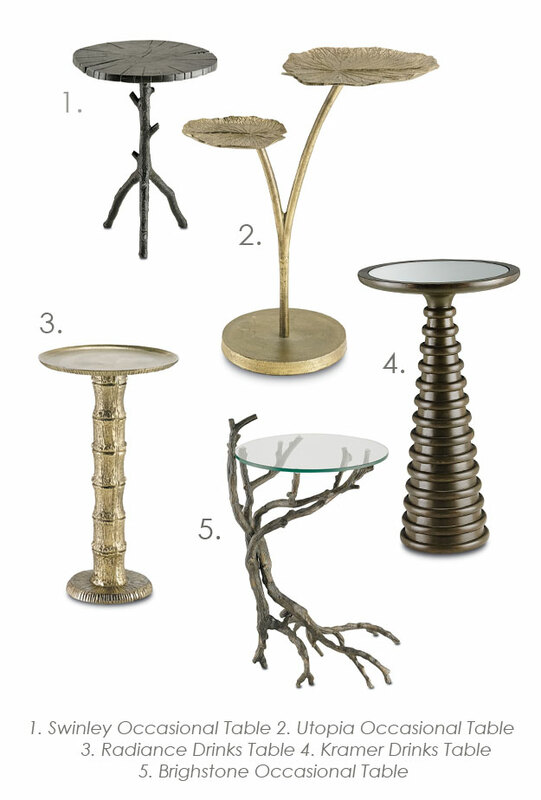 This entry was posted in Currey & Company, Entertaining, Products and tagged design trends, Furniture, Gold, Modern, Natural, occasional tables, organic shapes, Rustic on October 14, 2014 by Currey & Company.